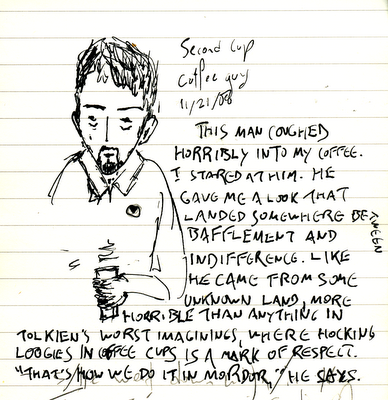 After the indignity to my coffee, I sat down and sketched while he took his diseased hands and scooped coffee beans into a bag for some soon-to-be-ill customer. 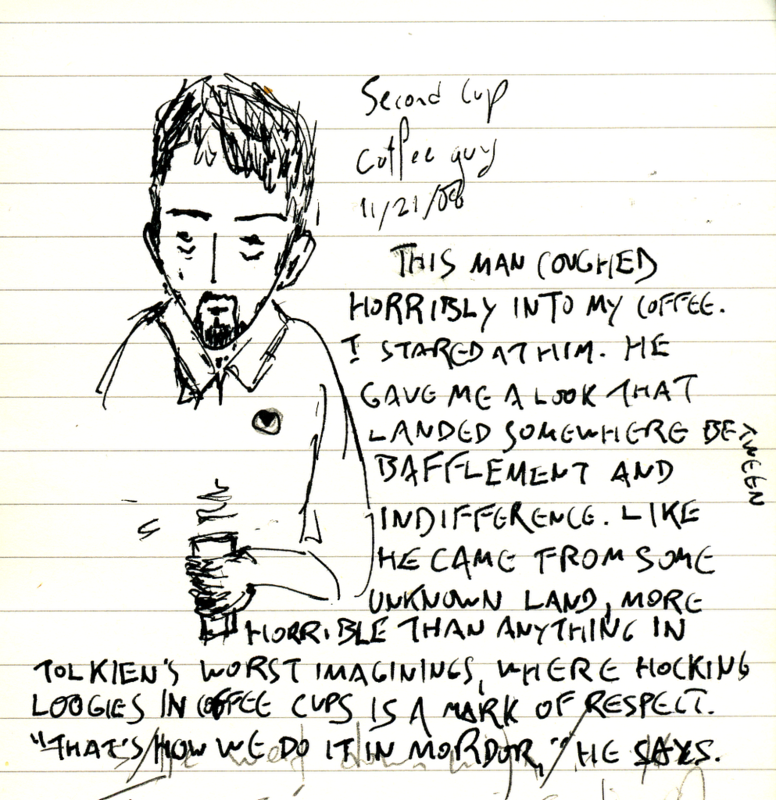 This was the point where I "whipped out my notepad," just like all the exciting artists and intrepid journalists do. I've been wanting to sketch this guy for a while because of his extraordinary face. He has a forehead that borders on the hydrocephalic, set off by eyebrows that belong to a fashion model twice his size, all narrowing down to a ridiculously pointed little chin. I haven't done justice to the eyes, which are large, clouded grey-green affairs that bulge out over the most hollow cheeks I've ever seen. The black ink has made him look a bit more affable and attractive than he really is, with a fuller goatee and thicker hair. In truth his hair is a light mousy brown, almost feathery. And you see where the text in the picture trails past the margin? That's the flaw that sets off the perfection of the whole. That's what makes it art, sucka. Here's something I drew one night at the bar. A table of RCMP cadets shaking off their aggression with Guinness. Yeah, that'll work. And don't draw drunk.